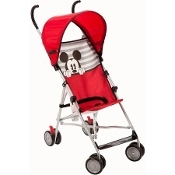 Our umbrella stroller is light weight for convenience and comfortable as it crades your child. It has a 3 point harness for safety. Colors and styles may vary.